If you're planning to do any shopping this Memorial Day weekend, it's a safe bet that you'll be asked for your email address when you get to the register. Capturing customer emails at checkout is one of the ways retailers sign people up for marketing emails. You don't have to give it, of course, but stores have gotten so adept at slipping in the request that many of us don't hesitate. The same is true when you buy something from an online retailer for the first time. You invariably have to hand over your email address. And unless you explicitly opt out, that means you're signed up for marketing emails. But it's no longer enough for retailers to wait until consumers have already made a purchase before targeting them for emails. They also want to grab the people who stop by to visit the website but don't buy anything. And they're even trying to sign up consumers who paused to look at an advertisement. Here are the sneaky ways retailers are getting your email address. Sign-up on arrival. Can you imagine if you had to sign a guestbook before walking into a store? Well, that's exactly what many online retailers do: The moment you arrive at a site, you're hit with an email sign-up form. In some cases, this is a simple pop-up that you can dismiss and get on with your shopping. But some sites, like Groupon, are so determined to get in your inbox that they won't let you in unless you sign up for emails. Usually there's a way to navigate around this so that you can see the actual site without signing up, but they don't make it easy. Sign-up on Twitter. Twitter has been slow to monetize its service, but as rumors of an IPO swirl, it's gotten more comfortable with finding ways to generate revenue. Case in point: Last week it introduced "lead generation cards," which allow brands to sign up users directly through a tweet. When a user expands a promoted tweet from a brand, he or she will be given the option of getting an exclusive offer, and signing up for promotional emails in the process. And since you used your email address to create your Twitter account, you don't need to write it out -- just click a button and Twitter will send it over to the company on your behalf. So far, Priceline and Full Sail University are among the few brands using the new feature, but expect retailers to get on board as they realize the potential of one-click email sign-ups. Sign-up on Google. 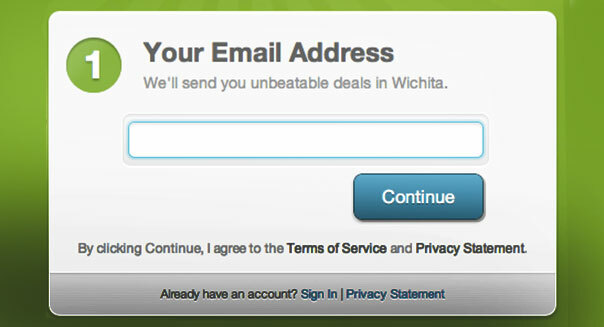 Twitter isn't the only tech company letting businesses sign customers up for emails with a single click. Google has long offered sponsored results -- those shaded search results that appear at the top of the page when you run certain searches. But in the last year and a half those advertisements have been taken to the next level by incorporating an email sign-up directly into the advertisement. Search for Lowe's, for instance, and the Lowe's ad that appears at the top will now have a field for entering your email address. And if you're logged into Google when you do your search, your Gmail address will be auto-filled; all you have to do is hit the button. As with Twitter, it's all about lowering barriers to entry -- companies want to grab those customers who might be willing to sign up for emails but aren't committed enough to actually type out their address. And if they also grab a few people who hit the button by accident or without knowing what they're agreeing to, the stores are probably okay with that. In most of these scenarios, you can avoid signing up for marketing emails just by knowing your rights and being careful where you click. But in cases where handing over an email address is necessary -- either because the site won't let you in otherwise, or because you want to get that promotional offer from Twitter, or simply because you want to make a purchase -- you don't need to resign yourself to being spammed. One strategy is to create a separate email address specifically for email sign-ups, so that messages from family and friends don't get lost amid an avalanche of coupon codes and sale announcements. You can check it when you feel like shopping; otherwise it's out of sight and out mind, and you don't need to worry about being enticed by offers to buy stuff you don't need. And remember: If you sign up for a company's emails and don't like what they have to say, the "unsubscribe" button is right there at the bottom. Stop texting and start saving! Yes, your smartphone can save you money – from coupons to comparing prices to making a shopping list, these seven smartphone apps are the key to making sure you don’t go over your budget. And they’re all free! This app, available on the iPhone and Android, allows users to scan the bar code of any item in the store and the app will find the retailer or online site that sells that item for the lowest price. This way, if you’re in a store, you can show proof to the manager that another store sells the same item for less, and ask the manager to match that lower price. Available on the iPhone, users can find coupons from tens of thousands of retailers, like Macy’s, Kohl’s, Gap, JC Penney, and Bloomingdales. When shopping online from your phone, you can drag the promotional code from the app and drop it right into the retailer’s website when you’re checking out. You can also redeem the coupons from the app in the store – no need to print anything out! It happens to consumers: You purchase an item and the next day it goes on sale! After you make a purchase, simply take a picture of the receipt using your smartphone, the app will store it and let you know if that items goes on sale – this way you can easily head back to the store and be credited for the difference between the sale price and the amount you paid. Some stores have a window of 15-30 days to get a price adjustment. The app is available on the iPhone and Android. Food from your local farmer’s market is generally cheaper (and healthier) than the supermarket. Using GPS, this app finds the nearest farmer’s market – it’ll even tell you what foods and produce are in season. It’s available on the iPhone and Android phones. Gas prices are always expensive. Type in your zip code and the GasBuddy app will find the cheapest gas station in your area. Various users post the prices at each gas station throughout the country – this way, we can all save! Available on the iPhone and Android. Do you tend to overspend when buying gifts for friends on special occasions? This app allows user to enter in a budget for the gift – it will then suggest gifts that fit within your budget. You can even enter in your friend’s age, gender and hobbies to make sure you find the perfect gift. The app browses some 150,000 products. Available on the iPhone and Android phones. Studies show making a shopping list (and sticking to it!) will ensure you spend less at the grocery store. This app lets users create a shopping list. To add items to the shopping list, you can scan the bar code of the item, talk to the app (using its voice activation feature) or enter it manually. Once you’ve purchased the item, you can cross it off your list, conveniently on the app!